Laser Hair Removal-It's almost time to pull out the beachwear! Are you ready? Laser Hair Removal-It’s almost time to pull out the beachwear! Are you ready? Almost everyone has unwanted hair somewhere on his or her body. Unfortunately, traditional hair removal routines can be tedious, painful and expensive over time. Shaving may last a day, waxing a couple of weeks and electrolysis is especially painful and can take forever! Therein lies the true beauty of laser hair removal. Laser hair removal can remove unwanted hair faster and more effectively than traditional methods. It is also THE MOST safe and effective method for treating large areas with thicker, course hair- such as a legs, backs and chest areas. How does it work? To eliminate hair, the laser emits gentle pulses of energy that pass through the skin to the hair follicle. This energy is then absorbed into the hair follicle to destroy it so that is unlikely to grow there again. Am I a viable candidate for laser hair removal? Laser hair removal can be performed on all areas of the body and on all types of skin. At Dermatology & Laser of Del Mar we utilize Gentlemax laser technology (Candela laser). This innovative new technology offers dual wavelengths to safely treat even dark skin types! Does it hurt? The laser treatment causes only minimal discomfort. Patients often say it feels similar to the snap of a rubber band. A topical numbing agent such as LMX may be applied 30 minutes prior to treatment for added comfort. Very slight redness or localized swelling may occasionally occur, but this usually subsides within the first 24 hours after treatment. How many laser hair treatments are required? Typically patients will see results in even one treatment although four treatments, roughly eight weeks apart, are recommended for optimal results. The exact number will vary based upon skin tone, hair color and several other factors. Every treatment is individualized to meet a specific patient’s needs. After your treatment series, you will be able to maintain a smooth, hair free appearance with simple maintenance. What is the first step? Scheduling your complimentary consultation! Deborah H. Atkin, M.D. will talk to you about removing unwanted hair and the importance of customizing a treatment for your skin tone and hair type. Dr. Atkin will talk to you about variables that may affect your individual results. 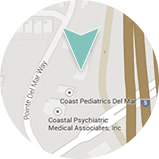 Who will perform my laser treatment at Dermatology & Laser of Del Mar? Our practice philosophy is that laser technology is best left in the hands of the physician experts. Dr. Atkin has 15+ years of experience as a board certified dermatologist and personally performs all the laser and cosmetic treatments in our office. Although many can perform these procedures in California, it is critical to consult with a highly trained professional. Without the proper knowledge, training and experience, laser procedures can lead to scars, burns and pigment changes in the skin. During your consult with Dr. Atkin, you can discuss any additional concerns you may have such as razor bumps, ingrown hairs or scars and discuss the cost of laser hair removal. Imagine the extra time you would save never having to shave, tweeze or wax again!